Upper Deck is joining forces with Cascade Games to expand on organized play events for Vs. System® 2PCG®. This new schedule of convention level events will bring League Play, Featured Formats, and more fun to players across the United States. Vs. System® 2PCG®, which released in 2015, is a game that requires a constant stream of opponents. 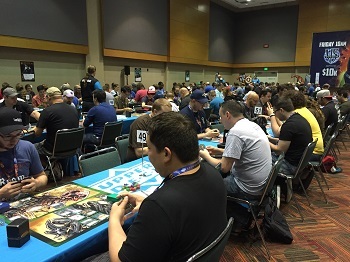 Currently Gen Con and Origins Game Fair are the only major events offered to players. Local gaming stores can also host an event with a purchase of an Organized Play Kit from their Vs. System® 2PCG® distributor. With the current monthly distribution model the metagame is changing frequently and this leads into the need for more events. Cascade Games, the premier tournament organization, has managed Upper Deck’s organized play events at Gen Con for last three years. Their team of hard working judges and staff make sure that every player leaves with a smile. It made the most sense then to include them in Upper Deck’s expansion of its Vs System® 2PCG® organized play. “The addition of more events headed by Cascade Games shows not only our dedication to a long future for Vs System 2PCG, but also that Upper Deck has always strived to offer the best experience for our consumers and players”, says Jason Masherah, the President of Upper Deck. Starting in November, Cascade Games will be running Vs System 2PCG events at ten shows throughout the next year. Each show will host demos, League Play and a Featured Format main event with a cash prize. This offers a variety of formats for players to explore. The cash prize for the main events will be $1000 for most of the shows. 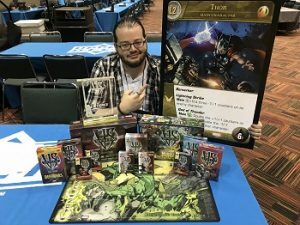 $2500 will be offered during the Regional events and the Championship at Gen Con will have a $5000 purse. Winners of the Regionals will also receive round byes during the following Gen Con Championship. Featured Formats, which will change throughout the year, bring new deckbuilding requirements so players can showcase their skills. These new formats will be highlighted in a future post. League play is another way that players will enjoy Vs. System® 2PCG® at shows and creates a special experience. With a purchase of Vs. System® 2PCG® product, players will use those cards to compete in matches during the show. Players receive a punch card for playing matches which can be redeemed for exclusive promos and even a limited-edition league-exclusive playmat. With new shows, new events, and new prizes, all that is missing is you. Grab your friends and join us for all the fun at an event near you. If you are interested in volunteering for these events you can contact Cascade Games at https://www.cascadegames.com/. I cannot overstate how happy I am to hear this news. Better organized play, with more events, has been a weak spot in VS for far too long. This is just the best news I could hope for.